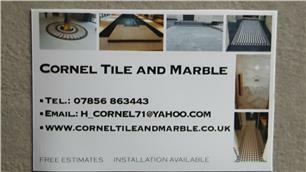 Cornel Tile and Marble - Tiler - Tiling based in Harpenden, Hertfordshire. Based in Hertfordshire, Cornel Tile and Marble have been established in Florida USA since 2004. From 2010 we carrying out work in London, Hemel Hempstead, Cobham, Hertfordshire. We pride ourselves on producing a high level of workmanship with quality and materials at a competitive price. Should clients require a complete bathroom installation, refurbishment or just tiling Cornel Tile and Marble can assist with all projects. With thirteen years of handling a wide range of materials that include all natural stone, mosaic, porcelain, granite and marble the company is confident that they can assist all clients with any requirements. Cornel Tile and Marble will be happy to provide a free estimation and as much help, advice, ideas and information needed prior to commencing works.